Campus de Ciencias de la salud, Bellvitge, Spain. Principal author of FirstGlance in Jmol and Protein Explorer; Proteopedia development team member. Objectives: Participants will use highly user-friendly software for visual investigation of 3D molecular structures of proteins, nucleic acids, and their interactions with each other and with ligands, substrates, and drugs; and of protein evolutionary conservation. Hands-on experience will be largely with molecules of each participant's choosing. Participants will learn how to create publication-quality molecular images, rotating molecules in Powerpoint slides, and custom on-line rotating molecular scenes in Jmol. Software: All software in this course is free, and works on Windows, Mac OS X, or linux. Shows, in Jmol, all published macromolecular structures. Yep, the entire Protein Data Bank! Shows the published abstract for each structure. 85% of models in the PDB come from X-ray crystallography experiments. Best Method: Use the sequence of your protein to search for 3D structures. Write down the PDB code(s)! One-slot search at main page, pdb.org. (Quick for text searching; Not for sequence searching). 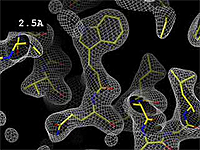 Or click Advanced Search at pdb.org Powerful but sometimes difficult to use; help is sometimes inadequate. PDBsum Good for sequence searching. Useful short summaries of hits. OCA Powerful and straightforward. Good for sequence searching. Useful results table. Proteopedia.Org. One-slot search (no advanced search). (Not for sequence searching). See Help:Searching. Can't find a structure for your sequence? Others.. Comparison of FirstGlance in Jmol vs. Protein Explorer. Typical hydrogen bond within a protein: hydrogen donor atom is covalently bonded to hydrogen; acceptor atom is not. Major histocompatibility protein (MHC I 2VAA): evolutionary conservation and variability from ConSurf. More..
At 2vaa in Proteopedia, show Evolutionary Conservation. Also check 4enl (enolase), and 1qdq (cathepsin B, noting the conserved surface Gly, Pro -- Why?). Check the range of protein functions included in the ConSurfDB result. Contacts: Anti-Alzheimer's drug analog (*) interaction with acetylcholinesterase (Dvir et al./Sussman, 2002). 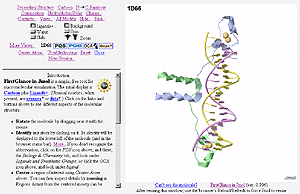 Key Resources: Probable Quaternary Structure Server: Specific Oligomers/Biological Units (Example: 1a4f). Compare with this theoretical model of a gramicidin channel in a phosphatidyl ethanolamine bilayer. Be sure to toggle the Water and Ligand buttons! Save any molecule you see! In Proteopedia, use the pdb link in the blue Coordinates section below the molecule. Jmol: click on the word "Jmol" (below the molecule, lower right corner), then top item on menu, then bottom item on submenu. If the data display in the browser as text: File, Save As, and save as plain text (filename should end ".pdb"). Molvis-list, jmol-users, PDB-list, etc. available from molvisindex.org.